Bottle comes without a tin. Colour: Pale gold. Nose: Toasted spices with a sharp fruitiness - citrus oils. There is also a subtle vanilla note. Body: Mouth coating. Palate: Spicy, almost peppery with a rounding creaminess. The fruitiness develops with the spices, reminiscent of rich fruitcake. Finish: Lasting. Cask type: Refill American hogsheads. 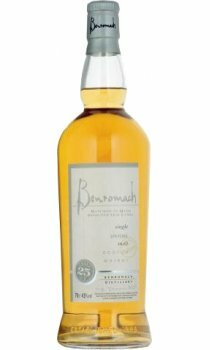 Whisky style: The fruit and spice characteristics of Benromach are balanced with the subtle sweetness of the American Oak. Michael Jackson is internationally the most widely published author on whisky. His Malt Whisky Companion is the world's best selling book on the subject and is in its revised 5th edition. Jackson is a Master of the Quaich. Colour: Full greeny gold. Nose: Perfumey. Fragrant hit of smokiness. Body: Creamy. Palate: Rich. Blossomy. Herbaceous borders. A British garden in summer. Finish: Lively. Warming. Comment: The best of Benromach. Confident, articulate, and in a mood to talk.